Fabrication and characterization of shape memory polymers at small scales - Download this document for free, or read online. Document in PDF available to download. The objective of this research is to thoroughly investigate the shape memory effectin polymers, characterize, and optimize these polymers for applications in information storage systems. Previous research effort in this field concentrated on shape memory metals forbiomedical applications such as stents. 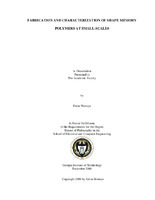 Minimal work has been done on shape memory poly-mers; and the available work on shape memory polymers has not characterized the behaviorsof this category of polymers fully. Copolymer shape memory materials based on diethyleneglycol dimethacrylate DEGDMA crosslinker, and tert butyl acrylate tBA monomer aredesigned. The design encompasses a careful control of the backbone chemistry of the materials. Characterization methods such as dynamic mechanical analysis DMA, differentialscanning calorimetry DSC; and novel nanoscale techniques such as atomic force microscopyAFM, and nanoindentation are applied to this system of materials. Designed experimentsare conducted on the materials to optimize spin coating conditions for thin films. Furthermore,the recovery, a key for the use of these polymeric materials for information storage, isexamined in detail with respect to temperature. In sum, the overarching objectives of theproposed research are to: i design shape memory polymers based on polyethylene glycoldimethacrylate PEGDMA and diethylene glycol dimethacrylate DEGDMA crosslinkers,2-hydroxyethyl methacrylate HEMA and tert-butyl acrylate monomer tBA. ii utilizedynamic mechanical analysis DMA to comprehend the thermomechanical properties ofshape memory polymers based on DEGDMA and tBA. iii utilize nanoindentation andatomic force microscopy AFM to understand the nanoscale behavior of these SMPs, andexplore the strain storage and recovery of the polymers from a deformed state. iv studyspin coating conditions on thin film quality with designed experiments. iv apply neuralnetworks and genetic algorithms to optimize these systems.